In Ancient Greece, participating in sports wasn't merely an excuse to exercise - it was also training for war. Wrestling, Archery, Javelin, all of these events were taken straight from the battlefield. Running was especially important, as the Ancient Greeks hadn't yet developed Armored Personnel Carriers to ferry troops about or email to deliver messages. To give our players a taste of what the Ancient Greek Olympics must have been like, we've designed a round-the-city race! Come join the fun and win big rewards! 1. When the event begins, go talk to Fitness Trainer 1 in the suburbs and claim Health Manual 1. 2. Following the clues in Health Manual 1, set off to find the next Fitness Trainer. Hand in Health Manual 1 after answering the trainer's question and claim a new manual. 3. Keep doing this until you get Health Manual 17 and then submit it to Fitness Trainer 1. Players are allowed to attend the race up to 6 times, and will be rewarded with 180 B-Gold each of the first two races in a day. Any racing after that will pull in 90 B-Gold each time. 1. Talk to Fitness Trainer 1 at the beginning and the end of the race. 2. If players gave up before finishing but have kept the last manual they got, then they can continue and finish the race to get B-Gold. 3. 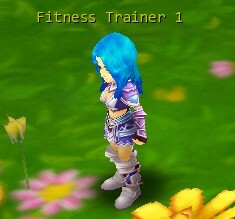 Check your mini map to find each of the Fitness Trainers.